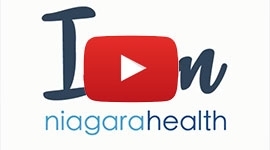 Niagara Health is leading the way and transforming patient experiences. About 200 members of the hospital and community celebrated Niagara Health’s accomplishments at Tuesday’s Annual General Meeting. "Our teams are doing extraordinary work demonstrating tremendous compassion while providing high-quality care for our patients and families,” Niagara Health President Suzanne Johnston shared with the crowd. 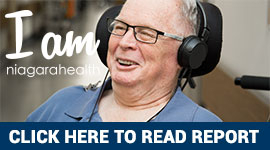 “We take great pride in what we are achieving at Niagara Health. We are optimistic about our future, for our patients, communities, and those professionals who choose healthcare as their life's work." 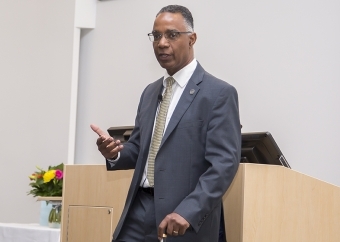 Keynote speaker Dr. Gervan Fearon, who is Brock University’s President and Vice-Chancellor, shared his thoughts on how partnership between two of Niagara’s largest institutions are contributing to the success of the region at large. One example Dr. Fearon provided was a heightened focus on creating employment and research opportunities at the hospital for new graduates. Over the last year, Niagara Health cared for 800,000 patients, performed 40,000 surgeries and served almost 200,000 people who sought care at the second busiest Emergency program in Ontario. Here are some additional highlights shared by Dr. Johnston in her address. Ministry approval to proceed to Stage 2 of our capital building plan. Reduced Emergency Department visits by 10% for heart and lung patients who are part of our Integrated Comprehensive Care Program. Received a national quality award for a program that focuses on prevention of blood clots – one of the most common complications of hospitalization. Our Workplace Acts of Kindness Challenge continues to spread with 15 departments across Niagara Health performing more than 10,000 acts of kindness in the hospital and in the community. Sought and received additional funding to operate an extra 26 beds to respond to an increase in activity in our Emergency Departments. Developing apps in-house to help bring patients’ health information right to their fingertips, and Niagara Health will use Artificial Intelligence in ways we have never imagined. These are game-changing ideas that can improve the delivery of care in ways that are difficult for others to match. Trillium Gift of Life this week recognized Niagara Health for helping to save lives through organ donation. Thirteen donors made possible 40 transplants. An additional 93 tissue donors enhanced many lives through their donations. A heartfelt thanks goes out to donor families; a beautiful tribute to their loved ones. Partnering with others to transform mental health care both inside and outside our walls. One way Niagara Health is doing this is by assigning a full-time person to our paramedic colleagues at Niagara EMS to help serve mental health patients in the community, avoiding Emergency Department visits when possible. For the fifth straight year, we achieved an operating budget surplus, enabling us to pay down our long-term debt.